In the moment, we often don't appreciate the value of our educations. Each day at school it can be easy to lose sight of the purpose of learning, and strive for high grades rather than growth of mind. However, the purpose of learning is not to earn a letter, but to practice innovating ideas that progress individuals and our world forward. Luckily, the students of Molalla High School have staff that place great value on curiosity and academic growth. Specifically, Brad Berzinski, the principal at MHS, believes firmly in the words of Albert Einstein, "I have no special talent, I am only passionately curious." Berzinski moved from Minnesota with his wife and three young children 16 months ago to take over the role of principal--a task that has proven to be daunting, but rewarding. "It has exceeded all expectations to be honest with you," Berzinski said. "It was a little bit scary at first, the notion of leaving the community that is all my family has ever known and uprooting them to move 1900 miles away was concerning for my own kids…But I realize now we haven't lost what we've left behind, but added to a new community." You may have seen the Berzinski family barbecuing burgers and hot dogs at football game tailgates, attending productions, club banquets, fundraisers, participating greatly throughout Share the Love events, or even at Safeway. "It has always been important to me not to just work in a place, but to be a part of a place." Berzinski said. As a current junior in high school, it is apparent to me that Berzinski genuinely cares about the passions and successes of all students as evidenced by his responses. "My proudest moment would have to be graduation last year…Knowing the level of hard work and that for some of the students it wasn't easy to get there is a big deal for individual students, families, and even us as educators," Berzinski said. He also particularly cares about ensuring all students have equal opportunities regardless of racial barriers. Emilie Mendoza, a junior at Molalla High School, explained his involvement in the Cesar Chavez conference taking place this coming spring. "Something I realized is that when I went to the Cesar Chavez meeting is he seemed like he really wanted to go," Mendoza said, "and like he cared about the advancement of other minority students like myself." 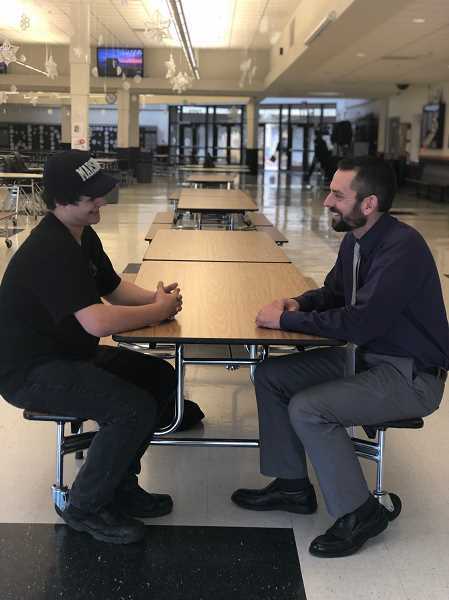 Through starting out as a history teacher right out of college, then becoming an assistant principal, a principal at the elementary and middle school levels, and finally getting to where he is now, Berzinski has gained an understanding of how people's life conditions affect them. "I think you recognize every student that walks through those doors has their own story," Berzinski said. "They bring their own set of experiences, both positive and negative and you can't help recognize how circumstances shape people." As teenagers in specific it can seem so natural to feel misunderstood by adults. For all students it is important for school to serve as a foundation of support: a message that Berzinski seems to understand very well. Because of this, Berzinski has also put a tremendous amount of work into broadening the course scope of Molalla High School. "A big push for me is making sure that we offer pathways for all of our students," Berzinski said. "For some, that's a four-year university, for others that's a two-year vocational community trade school or apprenticeship, it might be the military, et cetera…a big priority has been to develop our career and technical education programs." These include the manufacturing department, the agriculture department, the business department and the media department. Extending further funding to these areas of study while also introducing an intensive new program in conjunction with the Molalla Fire Department specializing in emergency assistance, and adding two new Advanced Placement classes have already been offered for the 2018-2019 school year. As a student, I can honestly say that the improvements being made are not without impact. Molalla High School is growing with the help of Berzinski's leadership and deep-rooted care for people. Class options are being diversified to ensure students accessibility of their dreams and engagement in the classroom. Teenagers like me are being taught that their voices are not irrelevant, but powerful forces to enact change, and students are genuinely being cared for. At this rate, I am hopeful that Molalla High School will continue to progress, and as expressed by Einstein, become ever more curious.